If someone asked me the factors in deciding how much sales engineering help a sales person needs, I would say it depends on three things. The role of the salesperson, the goal of the engagement, and the soul of the salesperson. Let me explain. Sales has so many different roles, but generally I can put someone into one of 3 buckets. Cold caller, hunter, or gatherer. If you are a cold caller you are generally working from a script for your product and technical details and if anyone shows interest or has questions, you are only passing them on. There isn’t a lot of Sales Engineering help needed here, except in technical details of the script and learning new stuff. When you hear questions you don’t know, follow up and get answers. As a Hunter you have to have some keen insight into your prospects. Sales Engineers can help you understand the prospects needs as well as show it in the best possible way. Combining the knowledge of prospect and product are key here. Information, demos and onboarding are all used here. Gatherers are too often head down and reacting to the customer’s current need. If you are being asked for something that seems odd, run it by a Sales Engineer before you waste a lot of time. Customers only know how to ask for what they want, not what they need, trust your sales engineer to decipher this for you. Oh, make time to be proactive with your accounts. As you can see each role has different needs, so do different goals. Every sales engagement should have a goal, and that goal should move the sales process closer to a close. So what is your goal? To answer the question? To show the feature? To close the deal? I hope your answer was the last one I listed. 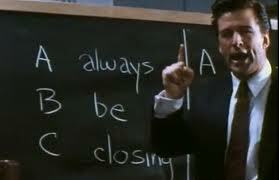 As Alex Baldwin’s character said in Glengarry Glen Ross “Always Be Closing”. If you are answering questions or getting answers for questions you don’t understand how they will ever lead to a close, stop ask. There is only one reason to answer questions or to show things, they are needed to close. Leverage your Sales Engineer to get you to a close position. You have heard the term old soul? That person who seems 85 years old when they turn 20? The same is true for Sales people. The sales maturity of a sales person is sometimes hard to gauge, but in general, the less mature they are, the more help they need. The help that these less mature reps can get from a Sales Engineer can be huge. The ability to learn information about the product they are selling is the first, but not the most important lesson. The most important thing they can learn is to see the danger signs in a deal. Sales people generally see the glass as overflowing and Sales Engineers see the glass as half full, maybe. Learn to be realistic and not get happy ears where everything you hear sounds like a close. So role, goal, and soul can help you understand how much help from a Sales Engineer your Sales people will need.